Cement driveways also known as concrete driveways are the most commonly used driveways in America. 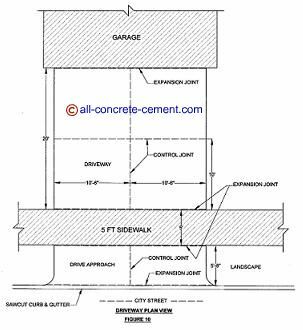 The finished elevation of concrete garage floor is critically important in determining the top elevation and slope of cement driveway. Driveway should be one of the last cement to be poured in any construction project. The reason is so that it does not damaged during construction. Heavy equipment such as backhoe, dump trucks, cement trucks, delivery trucks for framing, roofing, and drywall are capable of causing damages to your driveway. A good excuse to pour cement driveways early is weather. If you try to beat the cold winter weather, than it is a good reason to pour your cement driveway early but it must be protected from heavy equipment. When preparing to pour concrete driveway, use the checklist below as your guide. Figure 10 is used to illustrate the steps outlined below. Every city has their own requirements for constructing driveways. In order to avoid damages to public property and risk fines from your local building department, you must contact them and request information about what you can and can’t do. The sidewalk and curb & gutters shown on figure 10 are public properties. Also, the drive approach, though you are responsible for pepping and pouring, it will be public property. Some cities only allow certain contractor to do curb modifications and pour drive approaches. Should you proceed with the work not knowing this, you may risk the city bringing their approved contractor and redo the work including demo and re-pour the drive approach and hand you the bill. This type of mistake can easily cost you thousands of dollars. So be extremely careful when you touch public properties because they usually have high price tag. A quick phone call to your local building department should clarify what is acceptable and they will provide you with all necessary information for your driveway. Even if you hire a contractor to do the work, it is a good idea to get informed so that you can check up on your contractor. This step should be part of pre-planning before the concrete garage floor slab is poured. I had seen too many garage floor that were lower than the city street. When that happens, it can be disastrous during rain season. If the city street is higher than your property, you must plan and build accordingly. Raising your garage level especially if it is attached to your house is an investment worth pursuing. Connecting your driveways to city street that is higher than your property is inviting water to flood your garage and home. For the many homes that I had seen this happen, it is not a good situation. Such careless planning can cause property value dramatically dropped. If your state has Blue Stake, you must contact them prior to digging at your property. Blue Stake will locate any underground lines such as power, gas, sewer, phone, cable, etc. You are not charged for this service so there is no reason not to contact them. If you do not have Blue Stake at your area, ask your local city building department about contact information of those that provide this service in your area. If the city has no problem with you building your drive approach, it is time to shop for a concrete cutter. This step is necessary if you have combo curb and gutter as shown on figure 11. The curb wall need cut down to allow smoother transition as you drive in and out of your property. In order to trim down the curb wall, the dirt behind the curb must be removed. This must be done prior to the your concrete cutter gets to your site. This type of saw cutting is not cheap, roughly $20+/- for every foot cut. If you have valley gutter similar to what shown in figure 12, you don't need a concrete cutter. Grass, vegetation, top soil, and any bio degradable material where your driveway rests must be removed. The void left by these materials below the concrete driveway will cause settlement and cracks. Continue to Cement Driveway as it discusses forming your driveway.